Hello friends. I hope you are all well! By the time I give you this post, I will be in New Jersey, and I will have waved at everyone in the states on the way! Did you see me? Feel my presence? HA! I am bringing you these very easy cookies. My mom used to make them, I think everyone makes them BUT, mine are somewhat of a "minimalist" version. 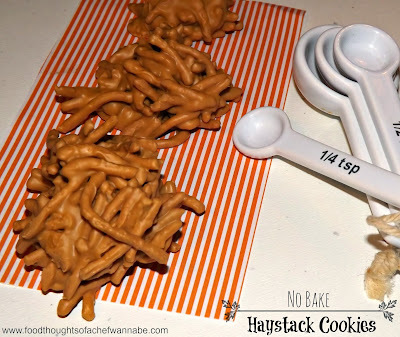 These are called HAYSTACKS, what are the peanuts and marshmallows doing in a haystack? Exactly! Is it like farm animal poo, or did huge hail fall on the haystacks? What is it?! I don't need 'em. In fact, I don't like them in my haystacks. 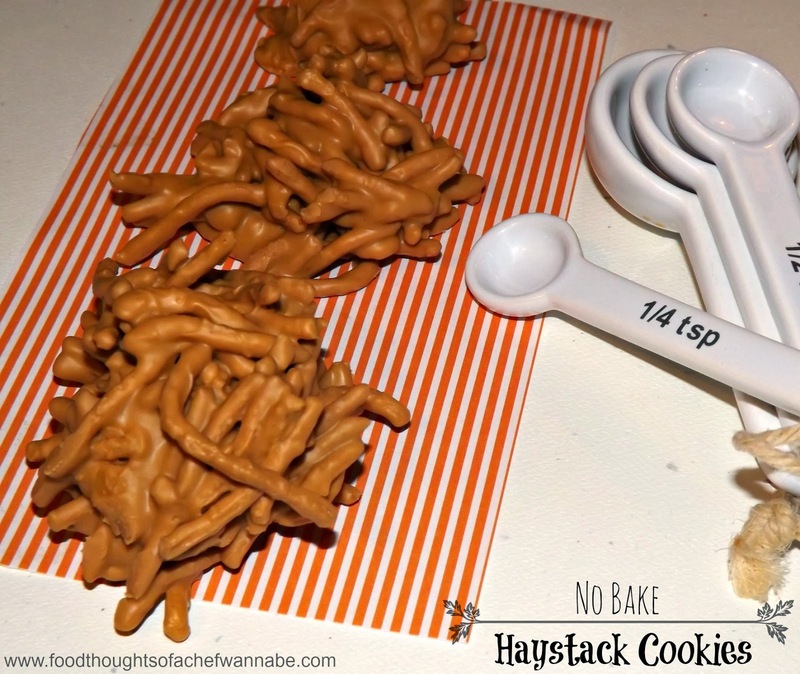 So you can add those things into yours if you like, but mine, I will take a REAL haystack looking sweet treat any day! These have 3 ingredients, I mean, start to finish MIGHT be 10 minutes. You can let them sit at room temp to "set" or stick them in the fridge for a bit. These will be great for Thanksgiving, you know that whole haystack thing. I wonder if they sat on haystacks while they ate the first Thanksgiving meal? In a microwave safe bowl, melt together peanut butter and butterscotch chips. Melt 1 minute at a time, and stir. When mixture is smooth, add in noodles and mix until all combines. Using a tablespoon, drop in piles on a parchment or foil lined baking sheet. You should get approx. 24 cookies. Let them set at room temp or in the fridge until hardened. Enjoy another easy, but delicious recipe!